Barrabool is an agricultural district 11 km west of Geelong. It was also a shire until 1994. The name is thought to be an Aboriginal word with several recorded meanings: oyster, or a slope down to water, or rounded mountain. The word was recorded as Barrabull by John Helder Wedge, surveyor in the western Port Phillip region, in 1835 when he described the Barrabool Hills. Local Aborigines were also described as the Barrabool tribe (1837). The Barrabool Hills are about 14 km from west to east, with easterly foothills at Highton, a Geelong suburb. By the mid-1860s the slopes of the hills were extensively cultivated, including vineyards. The Barrabool village began with churches and schools: an Anglican school was opened in 1847 and a Presbyterian school in 1858. The school building, a heritage listed tin and timber ruin, is near the Barrabool Hills Anglican church (1884) which is also heritage listed. The village, however, was overtaken by Ceres in importance, about five kilometres eastwards. As well as having churches, Ceres had hotels. 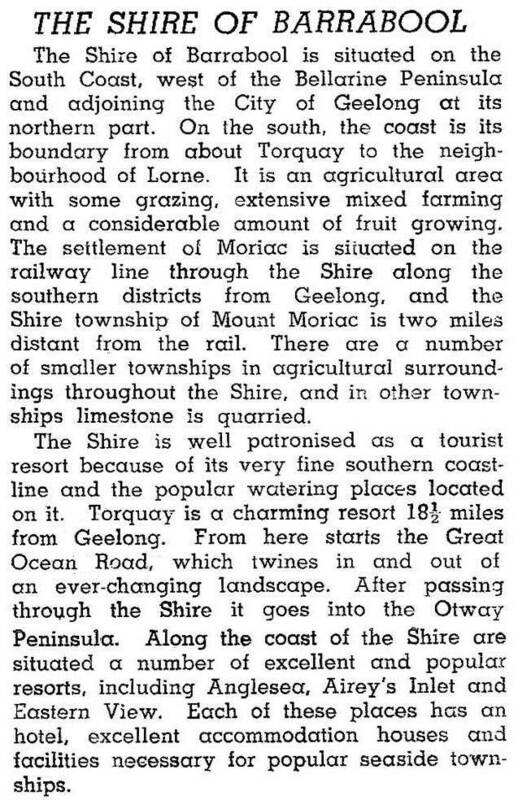 Barrabool Shire gained coastal territory by annexation of the area from Anglesea to the east side of Lorne in 1927, in effect the surf coast from Lorne to Torquay (but excluding those actual towns). Inland the shire extended to the Barwon River, taking in good pastoral and agricultural land. In 1994 nearly half the shire was agricultural land, of which the majority was used for grazing sheep and lambs (119,000 head). Meat cattle (90,000 head), cereals, potatoes and small fruit/vine areas made up most of the balance. Away from the coastal towns, most localities in the shire were agricultural districts with a school, post office and church or churches. Barrabool Shire was united with Winchelsea Shire on 9 March 1994, to form Surf Coast Shire. The large population growth was mostly in places that became outer suburbs of Geelong and the coastal holiday resort towns. In 1991, 2715 of the 6057 dwellings in the shire were recorded as unoccupied in the census, an indication that a substantial number of holiday houses still remained in the growing coastal resort towns.